You're not seeing double. The left window shows Norton 2000, the one on the right OnMark 2000 Assess. Although Symantec licenses Viasoft's product, Norton tends to be more up-to-date. Neither product was certain if OnMark itself is 2000-ready. When the calendar flips over to 2000, you don't want your office computers to flip out. Many agency offices have already completed remediation for their PCs. What, you haven't started yet? Pull out your IMPAC card and buy Norton 2000 Version 2.0 from Symantec Corp.
OnMark 2000 Assess Release 4.0 from Viasoft Inc. is almost identical, but I like Norton 2000 a little better than OnMark and a lot better than any other product. Symantec in fact licenses OnMark Assess from Viasoft and slaps on a Norton 2000 label. But Symantec does a better job than Viasoft of keeping its product current, with an easy LiveUpdate feature for downloading the most recent readiness data. Viasoft's Web site currently lists 3.0 as its most recent release. I could not find an update database with application readiness status. Norton 2000 1.0 earned a Reviewer's Choice designation from the GCN Lab earlier this year [GCN, Jan. 11, Page 1], and the second edition continues to show stellar performance. Both products work essentially the same. From a wizardlike interface, each first checks the system, then the applications and finally the data files. Both report the severity of any date-related issues found. Interestingly, both products noticed themselves in-stalled on the test systems. Both said that Norton 2000 was turnover-ready but could not determine the date code readiness of OnMark Assess. 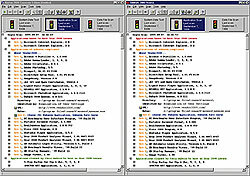 Norton's up-to-date database proved accurate in appraising two systems'one running Microsoft Windows NT 4.0 and the other running Windows 98. It showed different results from a scan using OnMark Assess. On the NT system, Norton 2000 detected 396 applications. It said two had year 2000 problems, 27 had unknown readiness status and 367 tested A-OK. OnMark Assess noticed 373 applications'23 fewer than Norton. OnMark said two apps had problems and 28 had unknown status'one being an application that Norton called 2000-ready. I checked and found the app was ready. Also under NT, both test programs found 100 data files, among them 68 spreadsheets. Although Norton said all 68 were fine, OnMark called 16 of the 68 unready. I opened each of the 16 and found correct four-digit years throughout. On a PC running Win98, Norton 2000 detected 277 applications and OnMark Assess saw 215. Norton reported that five applications were known to have year 2000 issues, whereas OnMark noted four. Norton 2000 flagged Microsoft Outlook 97. OnMark said Oulook 97 was OK. In fact, the Microsoft Web site says Outlook 97 does need a few fixes. But on closer examination, OnMark correctly assessed the status of a Dynamic Link Library file that Norton 2000 flagged. Norton said the outllib.dll should be Version 8.04. The file was in fact Version 8.5, a later version and indeed 2000-ready. When scanning the data files on the Win98 machine, OnMark missed again. One spreadsheet file listed at Severity 4, the most serious rating, did not include any date information. Norton skipped the file, correctly determining that it had no date information. Generally, Norton did a more complete and correct assessment of the contents of both systems. Under Windows 9x, both products could perform more thoroughly because the operating system did not get in the way as NT can. Both created a bootable disk that could run on an NT system to make certain the BIOS is ready. Norton 2000 links to a Symantec depository of files and can check its own version number, compare it with what is current, and then download and install itself if appropriate. This easy LiveUpdate feature clinches the Reviewer's Choice Designation for Norton 2000. Both products generally do a good job, but Norton 2000 does it better and easier.